DALK is a partial-thickness cornea transplant procedure that involves selective transplantation of the corneal stroma, leaving the native Descemet membrane and endothelium in place. A trephine of an appropriate diameter is used to make a partial-thickness incision into the patient's cornea, followed by pneumodissection or manual dissection of the anterior stroma. This is followed by placement of a graft prepared from a full-thickness punch in which the donor endothelium-Descemet membrane complex has been removed. The intention is to preserve the patient's Descemet membrane and endothelium. Similar to PK, the graft is secured with interrupted and/or running sutures (Figure 5) and these are then selectively removed post-operatively (Figure 6). DALK is useful for processes involving the corneal stroma in the presence of healthy endothelium. 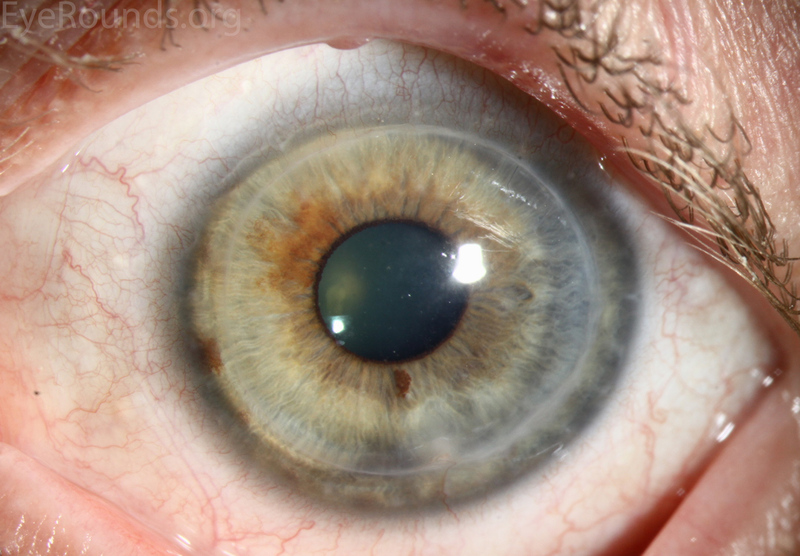 Examples include corneal ectasia (such as keratoconus in the absence of hydrops), corneal scars that are not full-thickness, and corneal stromal dystrophies (1, 15, 16). Figure 5: DALK performed for keratoconus. 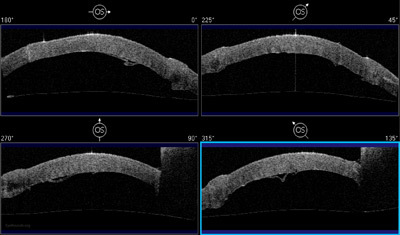 Figure 6: Clear DALK graft 3 years after transplant for keratoconus. 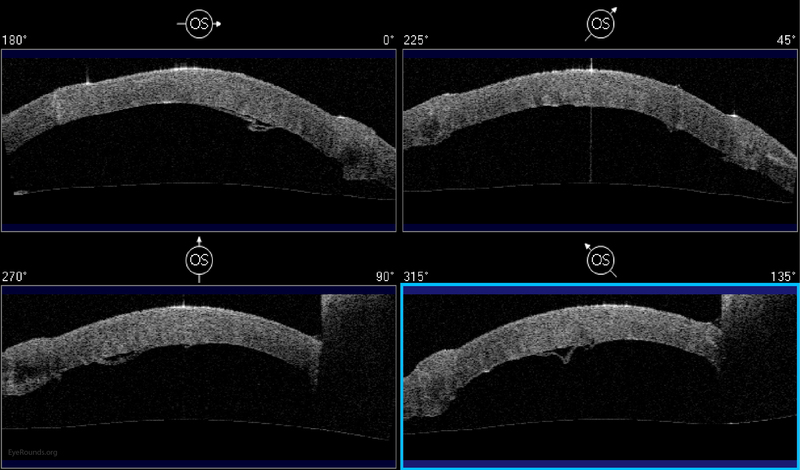 Fig 7a: Anterior segment optical coherence tomography demonstrating the redundant host Descemet membrane and endothelium in poor apposition to the graft tissue. Fig 7b: Normal anatomy is restored with reattachment of Descemet membrane to the donor stroma after placement of an air bubble in the anterior chamber. Because it is not a full-thickness procedure, the resultant wound is stronger than that of a PK. Leaving the host endothelium intact significantly decreases the risk of endothelial rejection. The surgery is more complex and difficult to perform than PK. If the Descemet membrane is perforated intraoperatively, the surgeon must convert to a PK. The "big bubble" technique makes dissection more consistent and is the preferred technique at our institution (12). 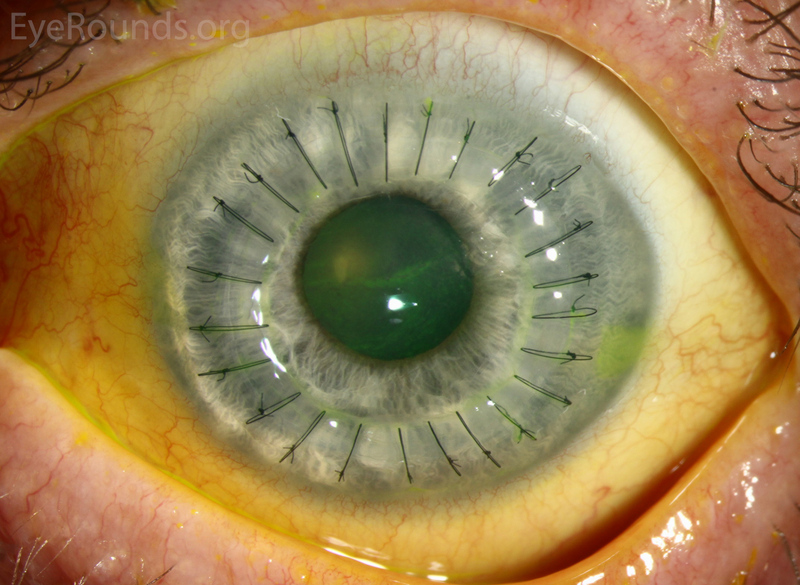 Mark the center of the host cornea with a Sinskey hook, and use a calipers to plan the host trephination. Trephinate the host cornea to a depth of 90%. Insert a 27-gauge needle, or a Fogla dissector followed by a Fogla 25-gauge cannula, into the posterior stroma. Inject air to dissect Descemet membrane posteriorly with a large bubble. Remove approximately 70% of the anterior stroma using a crescent blade or Devers dissector. Create a paracentesis incision to release aqueous. After marking the stroma and placing Healon over the mark, make an incision through the mark. Inject Healon into the space between the posterior stroma and Descemet membrane. Complete the separation between these two layers using a cyclodialysis spatula. Resect the remaining stroma using curved corneal scissors. Remove the donor endothelium from the donor graft tissue by manually stripping Descemet membrane, then trephinate the donor tissue. Secure the donor graft to the host corneal tissue using interrupted and/or running 10-0 nylon sutures. Rotate the sutures to bury the knots, assess the astigmatism using an intraoperative keratometer, and consider placing additional sutures to reduce astigmatic error.